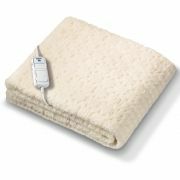 As Ireland gets ready for yet another cold winter, consider treating yourself to an electric blanket. We offer one of the of the best branded electric blankets from Monogram as we have found them to be fault resistant and reliable. In addition, the mattress cover is fleece lined and washable at 40 degrees. This range of electric blankets emits a gentle heat and they have built in auto shut off timers so that you can sleep uninterrupted. These products are manufactured to the highest standards and offer you comfortable, safety temperature controlled environments. No longer will you wake in a sweat in the middle of the night searching for the off switch. Share a bed? Not a problem, both the king and superking sizes are available in dual control so you can tailor the heat level to your liking. These blankets are energy efficient and can be left on over-night, without any danger. As this is an electrical product, please read the safety instructions carefully to ensure that you get the most out of your electric blanket. Ireland may not be known for its abundance of sunny days but curling up inside your custom heated covers with your book or favorite show will make that seem a blessing. One of the best things about this ShopLinen.ie product is that it heats up on both sides so you can use it under or over the duvet covers, great when you don’t want to worry about the tog of your other bedding and linen. The heating controls are entirely straightforward and you’ll easily find the temperature that suits you, as well as how to adjust it to ensure that you’re always at your most comfortable. For the snuggest, most contented sleep this season – take a look at our professionally recommended Morphy Richards & Monogram electric blanket options. Nothing beats the reliable traditional Fashy hot water bottles. ShopLinens have been chosen Fashy for their unrivalled quality, selection of colours, range of styles, and their high rubber content which makes them smoother and softer to touch. Also remember when filling your hot water bottle not to use boiling water, only fill two thirds of the way, and when screwing top on give your bottle a squeeze to push out any excess steam.